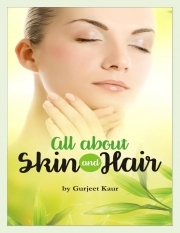 Description of "All about skin and hair (eBook)"
A book that will help you to find out excellent home remedies for you skin and hair. Also, a special section for women is included that focus especially on problems of women related to their skin and hair. You will find this book very useful at reasonable cost. Your daily skin care regime is going to be changed by following this book. I am India based 23 years old who passionate about natural home remedies to be included in day to night health care. This book is result of my own personal experiences. Reviews of "All about skin and hair (eBook)"